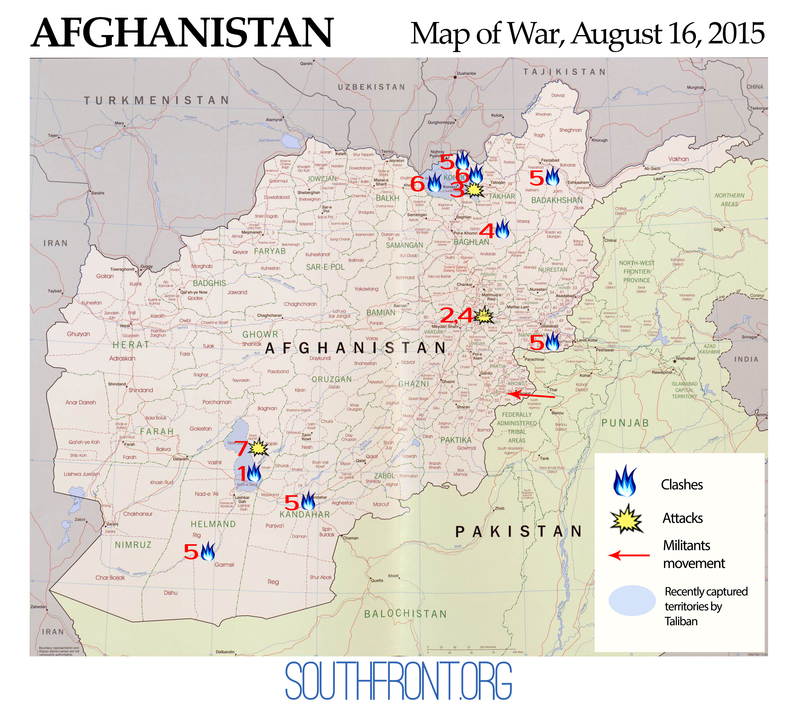 Afghanistan Map of War, August 16, 2015: Taliban’s Disunity Hasn’t Made the Group Any Less Lethal 5 out of 5 based on 1 ratings. 1 user reviews. This year the political environment in the Central Asia has been favorable to peace talks between Kabul and the Taliban. The Afghan and Pakistani governments are battling intertwined insurgencies. Using this mutual interest, they have tried to improve relations and Pakistan became a mediator in the peace process in Afghanistan. Nonetheless, the recent revelation of Taliban leader Mullah Mohammad Omar’s 2013 death accentuated a leadership struggle within the movement; the new leader of the Taliban, Mullah Akhtar Mansoor, does not have full support. The talks were halted. Moreover, Taliban, as any non-monolithic organization, is divided on the topic of holding any meaningful talks from the very beginning. August 10, The fight between different groups of the Taliban was observed in the Nahri Saraj district of the Helmand province. At the end of July, militants captured wide territories in the province. The Now Zad district is under direct governance of Taliban. Notwithstanding this, the recent series of attacks showed that the Taliban’s disunity has not made the group any less lethal. It shows that the Afghan government cannot effectively oppose to Taliban. August 7, Three suicide car bombs detonated in Kabul: in a residential area near an Afghan national army base, at a gate of a police academy and at an entrance to a base used by U.S. Special Operations. The bomb attack at the US base was followed by small arms fire and additional explosions. At least 44 people were killed and 265 wounded in these attacks. August 8, A suicide car bomber killed 29 and wounded 15 pro-government militants in the Khan Abad district of the Kunduz province. August 10, A suicide car bomb detonated at a checkpoint in the route to Hamid Karzai International Airport in Kabul. At least 5 people were killed and 16 wounded. These attacks are more evidence of the fact that a part of Taliban leaders don’t support the peace process between Afghan government and militants. Another feature of the situation is the fact that in 2014, the Pakistani government started a military operation “Operation Zarb-e-Azb” in North Waziristan and Khyber along the Pakistan-Afghanistan border as a renewed effort against militancy. The Pakistani military pressure on the various militant groups, including the Tehrik-i-Taliban Pakistan (TTP), the Islamic Movement of Uzbekistan, the East Turkestan Islamic Movement, Lashkar-e-Jhangvi, al-Qaeda, Jundallah and the Haqqani network, conducted a strong flow of militants through Pakistan-Afghanistan government. This summer, typical activity of Taliban has been strengthened by militants from the North Waziristan (90% of it is cleared from militants by Pakistani forces). August 12, Intense clashes between Taliban and pro-government forces of Afghanistan were going at the Helmand, Kandahar, Farah, Zabul, Nangarhar, Baghlan, Kunduz, Badakhshan. Every day, the Taliban attacks over 30 times in different parts of the state. August 13, Taliban started a new full-scale offensive in the Kunduz province and captured the most of the Khanabad district, including 60 settlements. The city of Kunduz will be the next target of militants. Since this spring, the Taliban has already captured part of the Chahart Darah, Qual’ah-ye Za districts. The Afghan government made an attempt to launch military operation in order to recapture the ground from militants, but clashes ended unsuccessfully. Thus, Taliban controls at least 40% of the province. August 14, Taliban militants killed at least 15 servicemen of the Afghan police at checkpoint in the Musa Qal’ah district of the Helmand province. In August, Afghan President Ashraf Ghani has started to sharply criticize Pakistan for its policy in the North Waziristan because it represents a threat for Afghanistan. He believe that the lack of the Afghan national army’s capacity to control the Afghani-Pakistani border is a problem of Pakistan. And the Pakistani government has to stop military operation against militants in North Waziristan. However, SouthFront assumes that Afghanistan’s actions are related to cooling of the Pakistan foreign policy toward the USA. Taliban is a rival enemy of the USA and ISIS in the region while the Afghan government is its ally. Furthermore, ISIS’s expansion to the north consists with the White House’s aim to destabilize the Russian and Chinese borders. Thus, the US has been trying to set fire between Kabul and Islamabad, hold a fragile situation together in order to prevent a rise of Taliban’s official political influence in Afghanistan because of a successful peace process. It’s a little hope for the start of serious talks without Islamabad’s support. This analysis explains another feature of the latest developments – a lack of ISIS activity in the region. Likely, Islamic State has been exercising some undetected organizational, military and other preparations to increase influence in Afghanistan. On August 13, the Afghan government sent a delegation, led by Foreign Minister Salahuddin Rabbani and included national intelligence chief Rahmatullah Nabil and Acting Defense Minister Masoom Stanekzai, to Pakistan to discuss an action plan after Islamabad-hosted peace talks with the Taliban. A day later, on August 14, the Afghanistan Chamber of Commerce and Industries (ACCI) announced that the medicines import from Pakistan will be banned. Meanwhile, Pakistan has raised custom dues at the Pakistani-Afghan border. Apparently, it isn’t a feature of the friendly relations. Find more Maps of War HERE.